Low-income Mexican immigrants with little formal schooling are healthier than the overall U.S. population, according to a number of measures. But once in the U.S., Mexican immigrants lose their health advantages within a generation, despite the improvement in their standard of living. Amy DePaul reported this series for Voice of OC as a 2013 California Endowment Health Journalism Fellow. 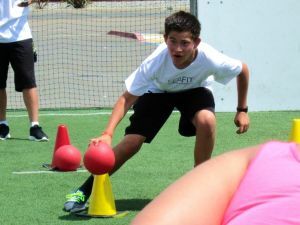 A boy exercises in Santa Ana at Dr. Riba's Fit Club. “You're not going to cross the desert in 110 degrees Fahrenheit if you're weak. Immigration is a selective process. It's for people who are relatively hearty and optimistic,” said Professor Leo Chavez, a UC Irvine anthropologist who studies immigrant health in Orange County. This story was originally published on October 1, 2013 by the Voice of OC.